Editor’s note: This story is told from a male viewpoint but is inspired by real events. I am an Afghan, born in Iran. Thirty-two years ago, my parents, seeking a peaceful place to raise a family, moved from a war-torn Afghanistan to Iran; there I was born the fifth child in a family of two sisters and four brothers. My parents worked very hard and took good care of their children. At the age of twenty, I was tall, fit and sharp. I was an ambitious young boy, a big headache for my parents. The bad child in the family, I was never satisfied with the situation they had adopted in Iran. For her small business, my mother brought cargo from another city and transferred it from the train to a shop. She was up late every night, doing accounting of customers’ bills. This was an overwhelming job for a woman in Iran. She did it for eight years and had terrible backaches. The X-rays showed atrophy on one of her vertebrae and also in her knees. I always argued with her to stop working. My father was a friendly, optimistic man of 65 whom everybody in the neighborhood admired as a truthful man. Although he was old, he worked hard. He used to leave the house at six in the morning and come back late at night, sometimes at 11 or 12 o’clock. He worked in a carton store, categorizing empty cartons, folding them into a group, and then wrapping them with string. His hands were cracked and crusty because of the strings. My older brother lived in Karag with his family, in a remote area far from the city. He worked as a guard for the Firforga factory and my other two brothers worked part-time with my father. Their responsibilities were to buy all the empty cartons from the markets. They had to transfer them to the store to be categorized. It was hard work and it took a long time to compile a cargo shipment for transporting to bigger stores in Tehran and Shiraz. Despite all this hard work, the money our family earned was not enough. We were Afghans and could not legally contract with big stores or even officially establish ourselves as business owners. Afghans did not have the right to have their own business. My father’s small store was hidden, but there was the chance of it being discovered. We did not have the right to own a car, which was a great necessity, and so my older brother hired an Iranian to drive and help with the transportation of big cargo. I worked for Reza, a friend in his shop, and rarely had time to help my father. Several times I tried to run a small business for myself. But this created many problems for my family. Whenever the Iranian police arrested me for travel violations, or for conducting business or other activities that were forbidden for Afghans, my family had to pay fines to have me released. I couldn’t accept that I didn’t have the right to make a living and use my talents. I was restless. This peace my family sought in Iran: how much did it cost us through these years? I could not accept this high price. My younger brother, a bright student in his first year of high school, was prevented from studying by a new law passed by the Iranian Authority. We heard the news in a circular: Afghans were deprived of continuing their education at schools. Fortunately, my two sisters could finish the year and get their diplomas. However, they would not be allowed to go on to the government-run universities. 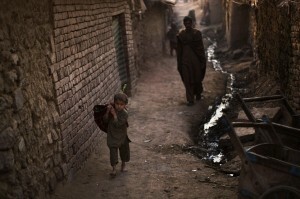 Tolerating this situation for Afghan refugees was no longer possible for me. My brothers and sisters had been born in a place that would never give us the right to travel through its cities without having an official passing letter, a place that would never treat us like citizens, and a place that would never accept us as full human beings. My father and mother had crossed a border for the hope of freedom, justice and peace, and we had not achieved it. I made my mind up—I had to leave this miserable situation. I had to repeat what my parents had done for the same aim. Nice one Mina, hope to read the rest of the story. There is no place such as our own country as we say home sweet home. 🙂 best of luck for the next part.